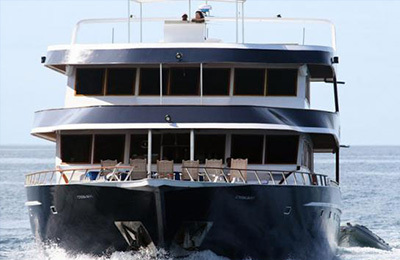 Dancer Luxury Surf Charter - Maldives, Northern Atolls Guests overall rating: ★★★★★ 5 based on 3 reviews. The ultimate Maldives surf experience ! Cruise Male’s North and South Atolls onboard a luxury 110 feet vessel that will take you the best breaks in total comfort and security. With a crew of 10 and a maximum of 14 passengers at a time, this is the experience of a surfing lifetime. The boat follows an elegant Balinese theme, with mahogany floors, stunning artwork and fittings while fitted with every modern conveniences and hi-tech communication system. You will be surfing daily a great variety of world class breaks in total seclusion, under the guidance of expert surfers with a perfect knowledge of local conditions. The main vessel has a tender 52 ft. surf boat that will take you to the breaks and a jet ski for tow-in surf. Surfers “widows” will be taken care of onboard and spend the day pampering in the spa, tanning, swimming, diving or just lazing out on the deck! 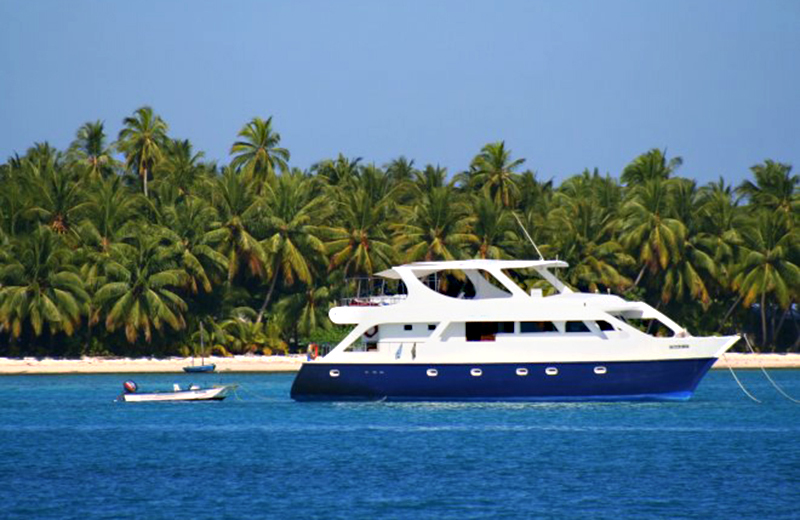 The Surf Charter Boat, one of the most luxurious, purpose built surf charter boat in the Maldives. 110 feet of unparalleled facilities for both surfers and non surfers alike. 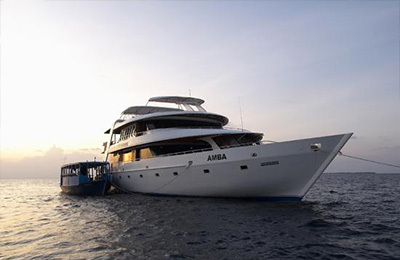 Experienced crew including surf/diver guides, masseuse and top level chef. The main lounge has huge plasma screen to view your day’s surfing filmed by the staff. 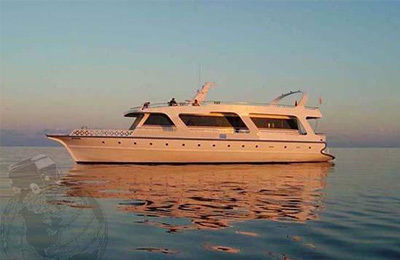 Spacious aft area on the main deck for buffet breakfast, lunch, gourmet dinner or sipping a cool drink. Male Airport (MLE) Male airport is an island just dedicated to the airport. Scheduled & charter flights: Qatar Airways, Martin Air, Condo, Eurofly, Lufthansa, LTU, Singapore airlines, Sri Lanka Airlines, Air Swiss, Air France, British Airways. "How lovely to hear from you! I am missing “home” and my “boat people” already. So very often these last 2 days, I’ve spaced out a bit at work and wandered back to Luxury Dancer and the wonderful warmth to be found in your home on the sea. Everyone from our holiday is missing Luxury Dancer. It’s all over our facebook updates and comments! Thank you very much for being so kind, patient, joyful and hospitable. We had a lovely lovely time in Maldives and it could not have been possible without all the little touches you, David, Dunie and the crew put in. It’s made our holiday feel not just a holiday, but a very special sojourn to the spiritual place we each hold within. I am truly grateful for the experience and immeasurably touched in ways I cannot describe. I have the highest admiration for you and David for pursuing and living your dream. How brave, how inspiring, how profound. Thank you. Before this trip, I’d enjoyed all my beach holidays for the frolicking and the fun, and sometimes, a bit of rest from doing nothing. But Maldives on Luxury Dancer has been different. Almost reverential somehow and it’s left me feeling privileged to have experienced something I cannot yet describe. I have come away with a deep respect for the ocean and all the life within. I’d always thought the ocean beautiful but now I think it is majestic. It teaches and it rewards. My biggest fear is that of drowning. Thus, swimming in the open sea has been a very special treat for me. There had been moments in the past week when I’d felt genuine sudden panic at the realisation that I could not find “ground” to stand on while swimming. I remember thinking it is only right to fear the sea. It is right and respectful. It is how, perhaps, a real love of it can begin, if that makes sense at all. And, of course, swimming with so many mantas unexpectedly has been a very very big privilege. I feel blessed. Please send our love to the crew. They had made a huge difference to our trip. Just knowing that someone was watching over me while I was floating at sea had given me courage to enjoy the water. The food was superb, the massage heavenly, and the fact that Luxury Dancer is always so tidy and comfortable is true testament to the great effort everyone puts in! There is so much that goes on behind the scene we don’t see but have the biggest appreciation for. Well done, Luxury Dancers! C’est magnifique! I will sort out photos this weekend. There are some lovely ones of wee Dune! Wishing you and yours all the very best and I sincerely do hope we’ll meet again. You have a beautiful family, Gaelle. It’s immensely inspiring. " "Thanks David & Gaelle and Damelza plus support team for a great week. Life is not the amount of breaths you take it's the moments that take your breath away? This sums up the week for me and I look forward to the next trip with the Luxury dancer team who were an amazing crew to be around. Until next time !! " "We just wanted to say THANK YOU to everyone for making the holiday so enjoyable. In all honesty, we reckon it was the best holiday that we've ever been on. We were a bit uncertain boarding Luxury Dancer but after our first night we knew that it was going to be incredible. Surfing every day, pushing our limits free diving, scuba diving with the sharks, fine dining at night and swapping stories with everyone... It doesn't get any better than this! Gaelle, Dune, David, Micah and of course the rest of the crew from Luxury Dancer your warmth and generosity made everyone's stay so enjoyable. Like you say, we all came as guests and left as friends. Finally, we'd love to have you at our home in Mollymook. If you're ever on the south coast of New South Wales, please come and stay with us!